Yesterday was the first time in a very long while that I saw the Boyz in their daily lineup. I’m pretty sure it was the first time since Fergus died. I quickly snapped a picture and rushed into the house to download the image from my camera. It had been so long, I couldn’t remember in what order and which direction everyone usually stood. Gracie Belle makes a beautiful “Snow White”. Enjoy your day. Never stand when you can sit, never sit when you can recline. How delightful to see Gracie Belle take her rightful place in the herd. She is such a lady, isn’t she? Let the minions stand guard while the lady sleeps. I adore this addition to your herd. It’s interesting that Patrick has assumed the vacant line up spot instead of staying at the end. I wonder if Gracie Belle will partake in her own sweet time. Love all the comments. She is such the lady. Enjoy ur day! We love that Snow White is comfortably resting waiting for her ‘doods’ to attend her! Snow White resting and waiting for the Prince to come and kiss her! Isn’t that just so fitting? She does what she wants. Precious! Love the Snow White reference, very fitting. They look like such peaceful donks. Gracie Belle is so silly! 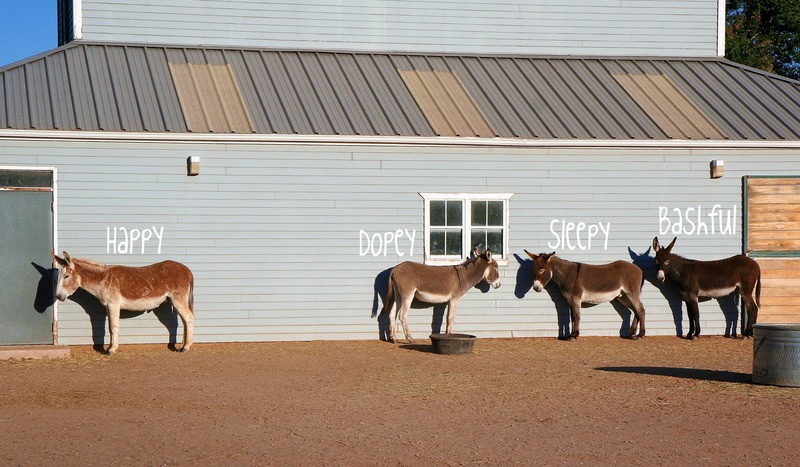 Might as well lay down in the sunshine while all of those crazy donkeys stand. I love Gracie Belle, so much!! Fantastic photo. Ha! That last picture made me laugh and laugh. 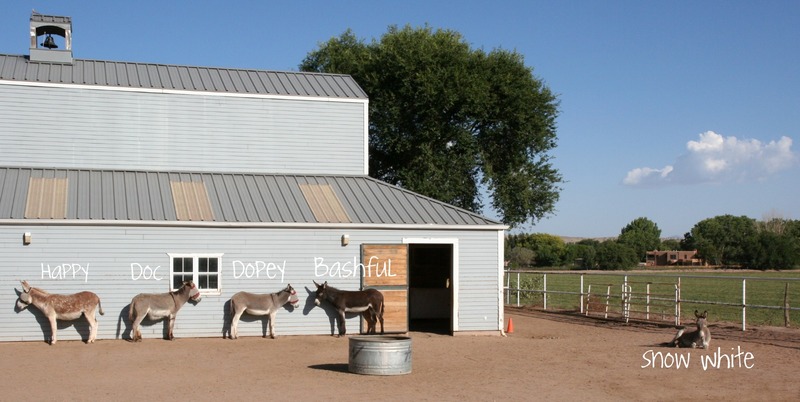 And do you think the boys are lining up against the wall like that for the warmth that radiates off the barn wall? I’ve wondered and wondered why the boys do the line up. The barn is to the east of the afternoon/hot western sun, so perhaps you’re on to something. I suppose I should start paying attention to specific time of day and temperature when I witness this behavior, but most days, it seems unbearably hot when they’re doing this. A gentleman always stands when a lady is in the room. So funny how they have their ‘spots’. Miss Gracie Belle is such a clever girl! Let the boys follow the moon or stars or magnetism… she has the best place!